With the harvest season in full swing, there's never been a better time to check out the new Trimble Township Farmer's Market. Every Friday from 4-6pm local growers gather just across the street from the Trimble Kroger's (look for the beautiful new red sign) to share the bounty of their fields and gardens with the community. 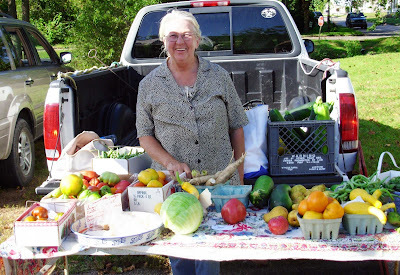 This week we feature Anna Marie Simpkins (see pic), gardening dynamo and one of the new market's first vendors. As you can see above, the only thing Anna Marie specializes in is everything. Currently offering a wide selection featuring beets, squash, zucchini, several kinds of tomatoes, basil, snap beans, and even some homemade peanut butter candy, Anna Marie's booth is a veritable produce aisle. Asked why she comes out to the farmer's market every week, rain or shine, she replies "just for the love of it all, I suppose." And love it she must, as her tomato patch alone counts for 150 plants this year! Stop by and pick up a few for yourself, guaranteed to tickle your taste buds. The Trimble Township Farmers Market opened this year as a joint initiative of Trimble Township, Rural Action's Agriculture Division, and Community Food Initiatives (CFI). Don't forget to stop by for some of the most flavorful produce around and check back next week as we feature another Vendor of the Week!